Pirates, Wizards and Medieval madness. Bubble Trikes, Flying Officer Kite and chums! Whip Resources. How to crack a whip. A Whip Buying Guide. Master of Ceremonies for Award Evenings, Gala Shows, Black Tie Affairs, Cabarets, Burlesque Evenings, Black Eye Affairs, Weddings, Barmitz vahs. Do please contact us for availability and a no obligation quote. 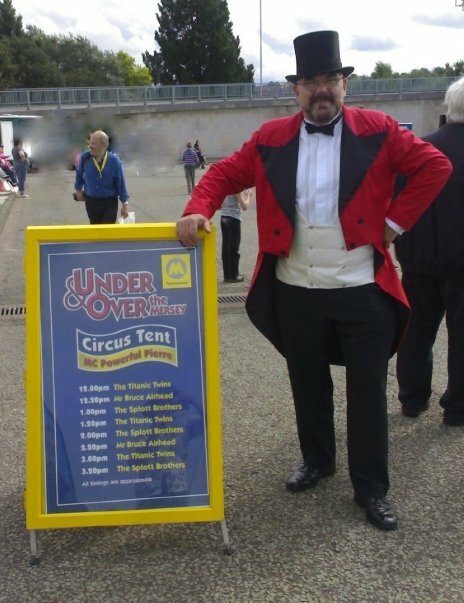 "Powerful Pierre" A Ringmaster Extraordinaire ! 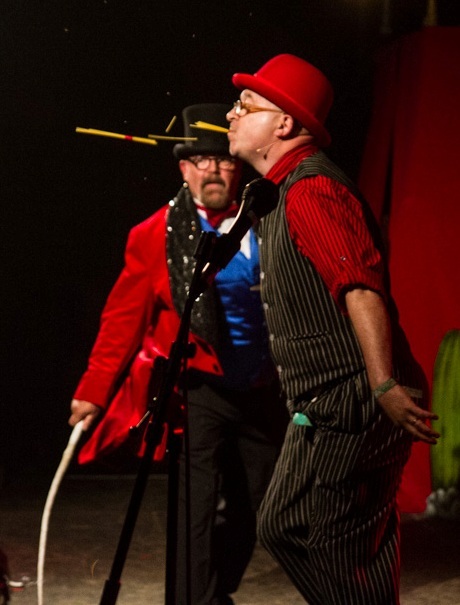 A seasoned Compere and Ringmaster, he's overseen The British Juggling Convention Gala Circus Show at Sheffield Town Hall , Sarah and Trev's wedding up in the wonderful Lake District , appeared as "Zidler" for a UK run of the The Celtic Manor's" Moulin Rouge Shows and performed the very first live target circus knife throwing act at Glastonbury Festival, was the guest Ringmaster for Zippo's Circus and hosted and compered a number of corporate events across the UK including the prestigious Syon Park Hall and The Grove. 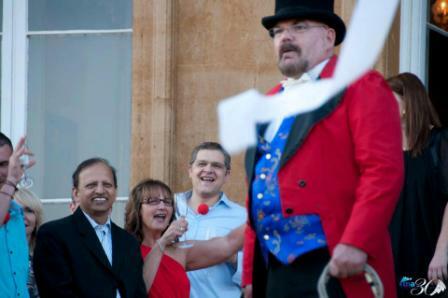 Peter brings a commanding voice and presence to any event, with an easy charm, fabulous moustache and dashing good looks (his words .. 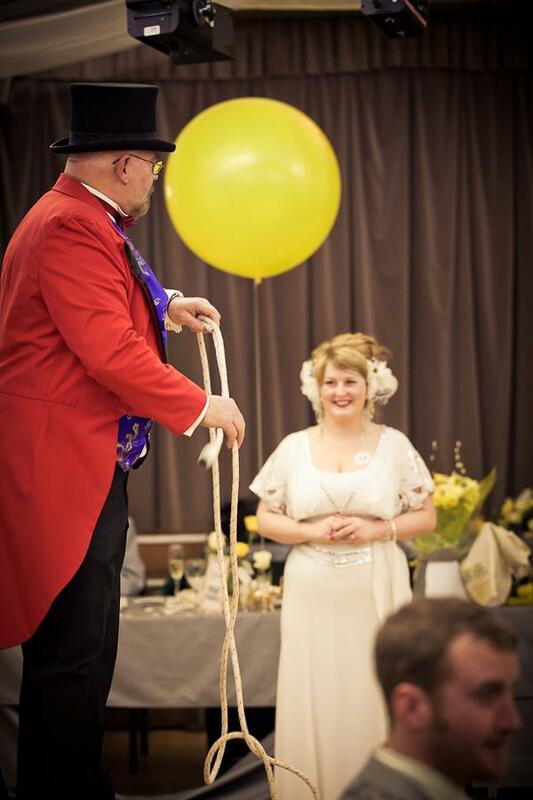 I assure you .... ) he'll ensure your corporate event or your wedding goes better that you could hope for. He's available in four distinct styles. Top hat, red tailcoat, shoes like diamonds and whip in hand he'll lead you a merry dance, announce your guests, master your toasts and present your acts or awards as needed. He's been Zidler for Moulin Rouge shows for The Celtic Manor Resort , a favourite of Weddings, Award Nights and Dining Ins around the country. Extravagant in a turquoises and gold brocade tail coat, matching hat, shoes and whip, different, fun and elegant. Do please drop us an email here: contact us or telephone 07875 826773 to discuss your requirements.